WASHINGTON (CN) – The Supreme Court struggled on Wednesday to decipher exactly how much fish a group of Native American tribes in the Pacific northwest are entitled to under a series of century old treaties with the federal government. “Suppose that there were more salmon than anybody knew what to do with and then the state did something that caused a decline, would that be a violation of the treaty?” Justice Samuel Alito asked on Wednesday. The case stems from what are known as the Stevens Treaties, which the federal government inked in 1854 and 1855, allowing a group of tribes to reserve fishing rights on “all usual and accustomed grounds” in exchange for most of their lands. Washington state has since installed a series of culverts that allow water from streams and rivers to flow under roads and highways. 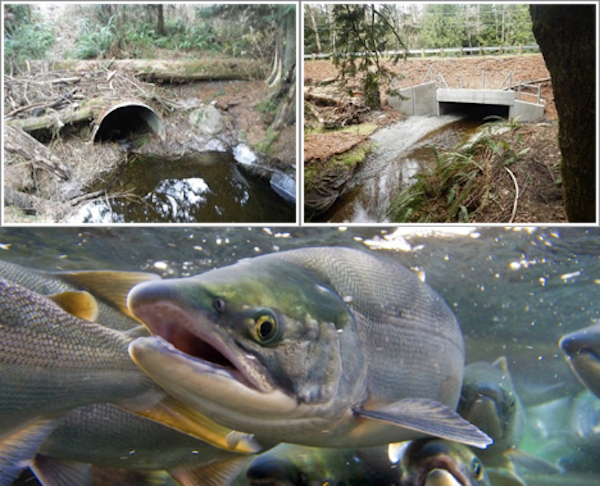 After learning the culverts in some instances made it difficult for salmon to swim upstream, the state began replacing them in the 1990s. Backing the tribes in 2001, the federal government went to court in Washington, contending that the culverts breached the old treaties because they cut back on the population of salmon in the water, restricting the tribes’ access to the fish they had been promised. A federal judge agreed and granted an injunction that required the state to replace its culverts with more fish-friendly waterways. Prompting the state’s appeal to the U.S. Supreme Court, the Ninth Circuit upheld the decision and went further, saying the Stevens Treaties implicitly guaranteed the tribes enough fish to give the tribes a reasonable living. Washington state Solicitor General Noah Purcell told the justices Wednesday that this standard would be an incredible intrusion on the state’s right to govern within its own borders. Under the Ninth Circuit’s interpretation of the treaties, any action the state took that even somewhat impeded a salmon run could be problematic. “If you define it that way, the treaties become a catch-all environmental statute that will regulate every significant activity in the Northwest,” Purcell said. Purcell argued the tribes and federal government should instead have to prove that a state action had a “large” effect on the salmon population without any significant public-interest justification. But the justices found this difficult to pin down, pressing Purcell in vain to specify what size reduction in the salmon population would satisfy his proposed test. “I mean, do you have a number in your head?” Justice Elena Kagan asked. Purcell also argued the state should be able to take actions that are in the broad public interest, even if they put up barriers for the fish. Without this carve-out to the treaty, every dam in the Pacific Northwest would have to come down, Purcell argued, and the state would be on the hook for billions of dollars in renovations to their culverts. Some of the justices found this argument fishy, struggling to find the exemption in the treaty. Justice Neil Gorsuch pressed Purcell on how the court could grant the state this exemption without effectively scrubbing the treaty of all meaning. “The point of a treaty I would have thought would have been to freeze in time certain rights and to ensure their existence in perpetuity, regardless of what other social benefits a later municipality might be able to claim,” Gorsuch said. Arguing for the federal government, Assistant to the U.S. Solicitor General Allon Kedem agreed with this. For the government to keep its word, he said, the tribes need to be able to access healthy populations of fish. He allowed that the treaty would let the state take certain steps that would cull the fishing population but serve a compelling goal, such as the bans on shellfish harvesting that states impose in the face of dangerously high bacteria levels. Kedem also disclaimed the Ninth Circuit’s ruling that the treaty granted the tribes enough fish to maintain a moderate living standard, calling it nothing more than support for an alternative holding. “The United States has never asked for and did not receive a ruling guaranteeing to the tribes a moderate living from their fisheries,” Kedem said. William Jay, an attorney at the firm Goodwin Procter who represented the tribes, said the court should require Washington to clear away blockages that have a substantial impact on the fish populations, saying the tribes gave away a lot to maintain their access to fish. “If the promise made by the United States in exchange for millions of acres of the tribes’ land means anything in terms of substantive protection of the fishery, it protects against a threat to the fishery like these, a threat that obstructs fish from getting to the usual and accustomed fishing grounds where the tribes have a right to fish and that substantially degrades the fish population,” Jay said. But Alito again could not figure out what this standard would actually look like, failing to get a solid number that would show when the state’s efforts reduced the fish population too drastically.